-Brushless motor-ZAPAK patented single motor design provides extremely long service life. -Max. tension 400 KGS ( 4000N) - ZP97A heavy duty model. 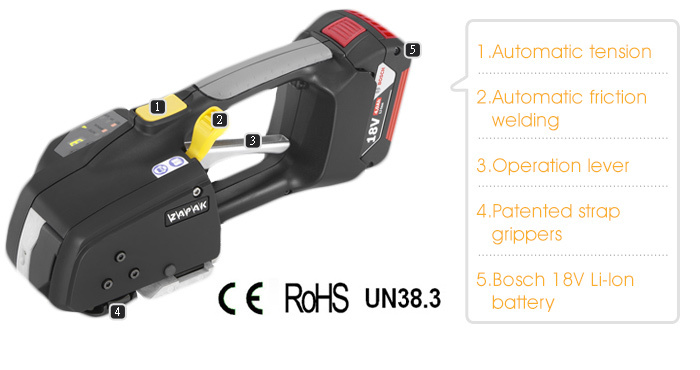 -Single-handed operation performs automatic tensioning, friction welding and cutting efficiently. -Pre-programmed touch panel with digital signal to suit different operation needs instinctively. -Special tool retreating device ensures smooth and easy removal of tool. ﰀ-Unique rear-end roller design prevents scratches or worn out damages on strapping objects. ﰀ-User self-adjustable strap widths guiders and self-changeable wearing parts. - Li-Ion battery complies with UN38.3 safety requirements.